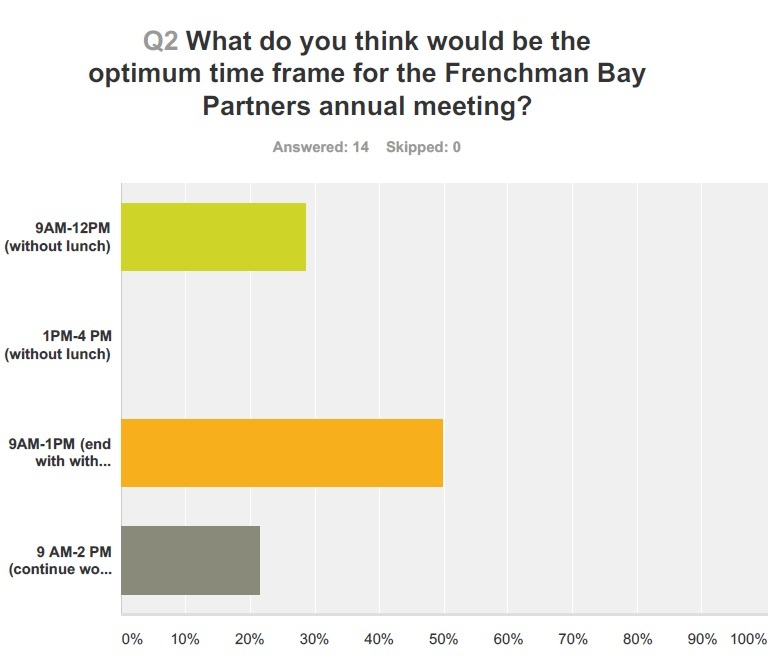 Over the course of six days, 14 people responded to an eleven question online survey via Survey Monkey regarding the Frenchman Bay Partners Annual Meeting held on May 2, 2015 at the College of the Atlantic Gates Center. The survey link was emailed to attendees twice and posted on the Frenchman Bay Partners Facebook page. The Frenchman Bay Partners consists of individuals and organizations representing marine industries, research organizations, tourism companies, education institutions, conservation groups, land trusts, municipalities, and more. This year’s meeting was held at the College of the Atlantic Gates Center. 37 people attended. The meeting was set up around two sets of Flash Talks followed by World Café-style breakout sessions. The first set of talks and discussion focused on Partnership Successes. Speakers included Jane Disney, Bridie McGreavy, Chris Petersen, and Anna Farrell. The second round of talks and discussion focused on Emerging Opportunities. Speakers included Jane Disney, Jenn Booher, Duncan Bailey, Emma Fox, and Sean Smith. Following a potluck lunch, discussion centered around What Next and Who to Involve. Elections wrapped up the day. 70% of respondents reported the length of the annual meeting was just right. 50% recommended ending the meeting with a potluck lunch; 20% recommended continuing work after lunch, and 30% recommended ending before lunch (Figure 1). The Flash Talks were a new addition this year, and 100% of respondents liked the presentations “Somewhat” or “Very Much”. Providing time for questions was recommended. Respondents suggested hosting the following speakers in the future: Robin Hadlock Seeley, Kohl Kanwit, Meggan Dwyer, Mark Whiting, students with data to contribute, and government liaisons. The World Café breakout sessions were also new: 43% of attendees liked them “Very Much”, 50% liked them “Somewhat” and 7% did not like them at all. 92% of people thought the World Café breakout sessions were either “Too short” or “Just right”. One commenter suggested identifying which topics were being discussed where before the session started to orient people. Another suggested making them explicitly about networking with people with similar interests. A few people suggested structuring the discussions better, with stronger facilitation, specific talking points for each topic, or a simple goal rather than multiple goals per session. 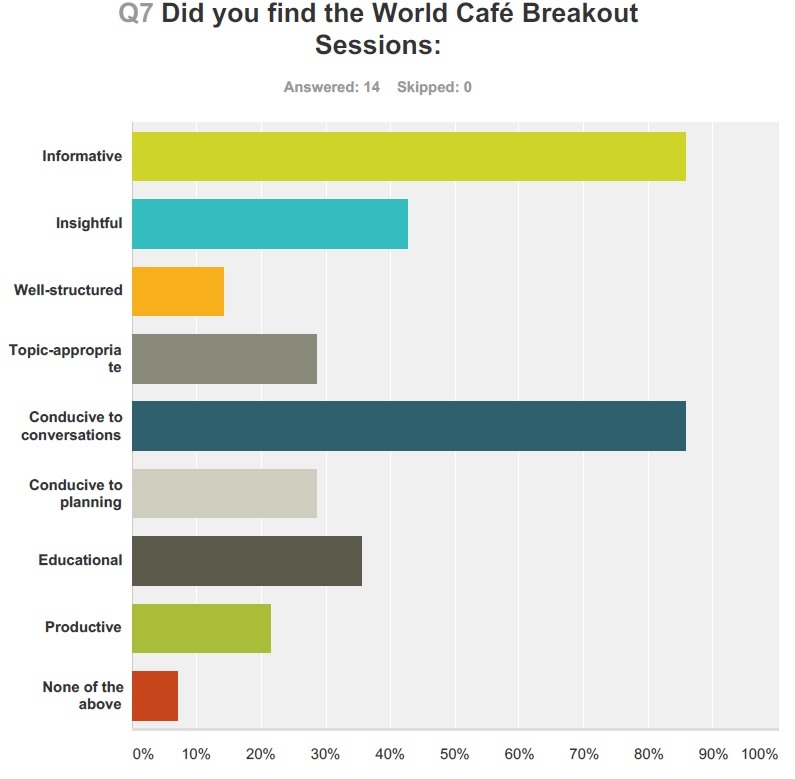 View Figure 2 to see what respondents thought of the World Café sessions. When asked what other activities individuals would like to see at the annual meeting, 80% of respondents wanted to see displays by Partners about their organizations, 73% wanted to see presentations of student work related to Frenchman Bay Partners goals and strategies, and 55% think an introduction to the Conservation Action Planning Process of the Frenchman Bay Partners would be beneficial. 100% of respondents were either “Somewhat Satisfied” or “Very Satisfied” with the Frenchman Bay Partners annual meeting. Additional comments included sharing out any plans, ideas, and action agendas developed from conversations, catering the event instead of making it a potluck, and devoting less time to presentations and more time to discussions. Thank you to all who took the survey! Your input is valuable for shaping future events.